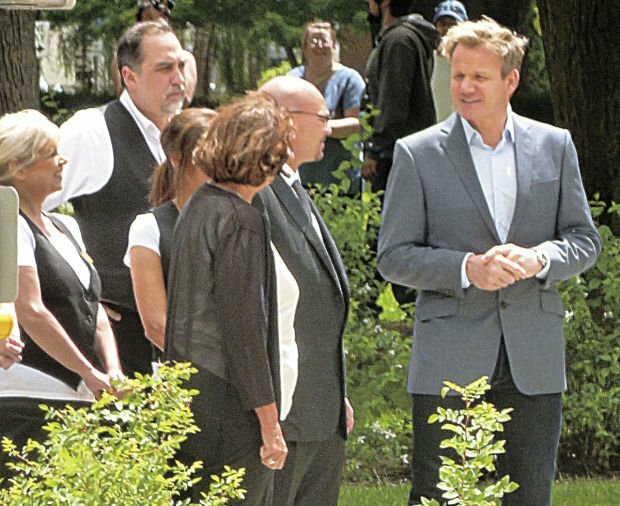 "Hotel Hell" host and celebrity chef Gordon Ramsay talks to Monticello Hotel owner Phillip Lovingfoss and manager Ginger Allred in June. The hotel's restaurant and lounge closed on Wednesday. The Monticello Hotel restaurant and lounge — which were featured as part of the “Hotel Hell” filming this summer — abruptly closed Wednesday. Gordon Ramsay and “Hotel Hell” couldn't save at least part of the Monticello Hotel — the owner closed the restaurant, lounge and banquet facilities Wednesday. Owner Philip Lovingfoss decided to “pursue other endeavors,” according to a press release sent Wednesday morning to The Daily News. The notice says the closures are effective immediately but the hotel, motel, apartments and business offices rentals will remain open. It also says Lovingfoss hopes to find someone else to step in and buy or lease the restaurant and lounge space. Deposits for weddings and other events will be refunded, the press release states, as will gift cards and Rotary Meal cards. Neither Lovingfoss or the spokeswoman who sent the email could be reached for details on how many employees the closure affects, what kind of notice they were given or how many events now have to be cancelled. 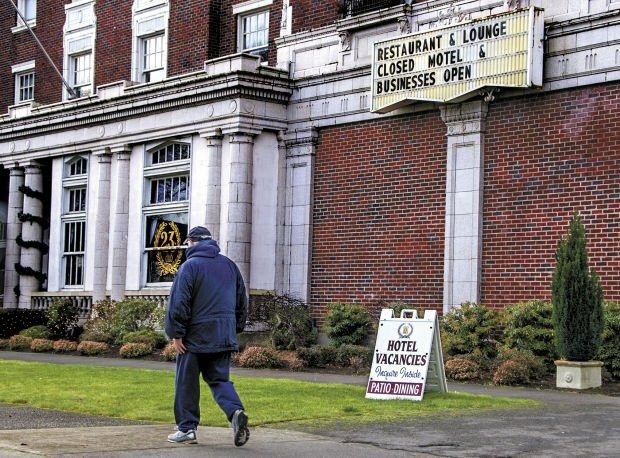 The historic hotel — which celebrated its 90th birthday this summer — has struggled financially for several years. That’s what led Lovingfoss and manager Ginger Allred to sign up for the FOX reality show “Hotel Hell,” which filmed at the hotel this summer. Celebrity chef Gordon Ramsay visited the hotel and restaurant and offered suggestions for improvements. The episode has not aired — FOX says they haven’t set an air date even though Ramsay has tweeted the series starts again sometime this month — so exact details of Ramsay’s summer visit aren’t public. The tidbits that have leaked out, though, made it clear Ramsay wasn’t impressed. He ridiculed the motel rooms adjacent to the hotel and had the restaurant revamp its entire menu. When it reopened in June, many favorite standbys were replaced with a new, severely streamlined menu that wait staff said allowed them focus on a few great dishes. Fancier items such as roasted butternut squash rigatoni and cauliflower puree replaced items like the original hotel tournado and Dory’s famous ribs. In recent months some of the original items were added back in. The show required everyone involved in the show — even diners at the restaurant — to sign strict confidentiality agreements. As such, Lovingfoss, 48, has declined to comment about the show and could not be reached for comment Wednesday. Talking to customers in the dining room this summer, though, Lovingfoss said the filming had been rough and that he wasn’t looking forward to watching the episode. The filming started out on a sour note for Lovingfoss when he was arrested on suspicion of DUI the night before in front of the hotel — mere steps away from the production crews that had already set up in the parking lot. In November, Lovingfoss reached an amended plea agreement that will reduce the charge to first-degree negligent driving if he undergoes treatment, completes probation and doesn’t have any more arrests. FOX has indicated the arrest will be featured in the episode. The closure was distressing news to Hazar Jaber, who had an event for Family House Academy scheduled there in May. The annual event for 250 people is the school’s major fundraiser, she said Wednesday. Jaber booked the space this summer and said she wish they’d received more notice on the cancellation. She just sent out save the date emails this week. She also wondered why the hotel accepted any reservations if they were thinking about closing, noting a wedding had been booked on the date in May she initially requested. “I bet they’re really worried,” she said of the bride and groom. Jaber said she hopes to speak with the hotel about still using the space and providing her own catering. If not, she’ll spend the first few days of the new year looking for another venue. “It’s a very bad shock,” she said. Wednesday’s closure affects Ginger’s Restaurant — which served breakfast, lunch and dinner — and the 23 Club Lounge as well as all business with LMC Group which also handles banquets and weddings. Deposit refunds will be available within the next seven to 10 days, the notice states. Gift cards and Rotary Meal refunds will be available for 90 days at the hotel’s front desk. The hotel itself is closed until Friday, according to holiday closure notice posted on the front door. Barbara LaBoe covers courts and law enforcement for The Daily News. Reach her at 360-577-2539 or blaboe@tdn.com. The Monticello Hotel’s “Hotel Hell” appearance turned into an intervention for the owner and the hotel Monday, but former staff were outraged that FOX didn’t mention the closures that followed the show’s visit. Our take on the best and worst of recent news.